7 1/2"long x 5 1/4" wide x 3 1/2" tall. The knob is shaped like a dainty flower bud and the plate is in the shape of a floral leaf. This small butter dish holds one stick of butter. 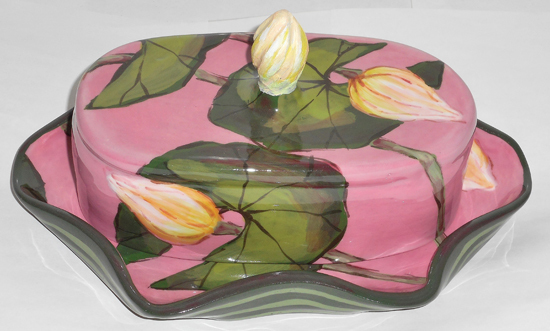 We also offer any one of our patterns of your choosing to be painted on this butter dish, for no extra charge. Just give us a call at 1-508- 932-2574 for us to accommodate you. Here by popular demand, now only 7 1/2" long by 3 1/2" tall, our new small butter sets snugly hold a single butter stick. Enjoy a collection of familiar butter dishes and English butter box shapes.